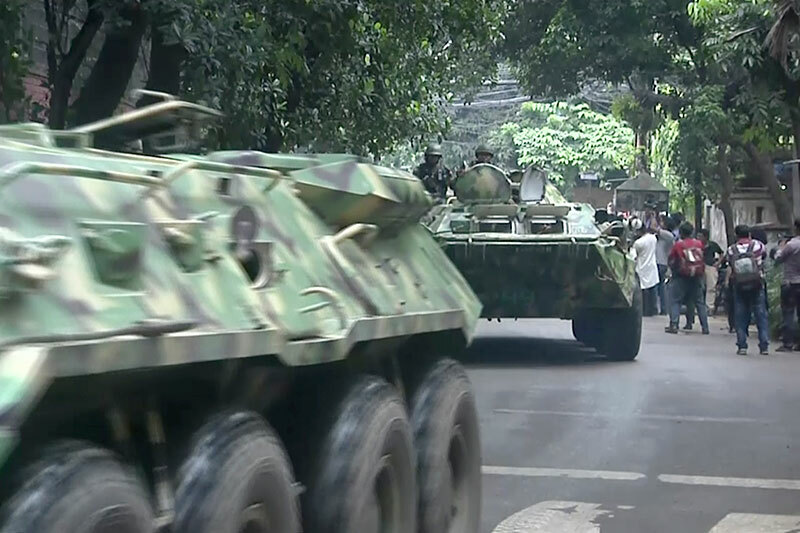 DHAKA, Bangladesh, July 2: Bangladeshi forces stormed an upscale Dhaka restaurant to end a hostage-taking by heavily armed militants early Saturday, killing six of the attackers and rescuing 13 captives including foreigners. The military said 20 of the hostages had been killed during the 10-hour standoff, and officials from Japan said seven of its citizens were unaccounted for. 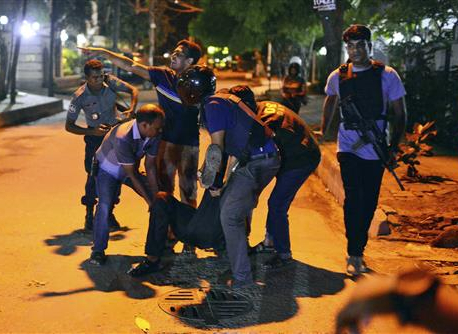 About 35 people were taken hostage, including about 20 foreigners, when gunmen stormed the popular Holey Artisan Bakery in Dhaka's Gulshan area, a diplomatic zone, on Friday night during the Ramadan holy month. Two police officers were killed at the start of the attack. Bangladesh Brig. Gen. Nayeem Ashfaq Chowdhury said six attackers were killed by the paramilitary troops who mounted the rescue operations. They also recovered explosive devices and sharp weapons from the scene. Chowdhury did not disclose the identities of the hostages. Prime Minister Sheikh Hasina condemned the attack, which was claimed by the Islamic State group, and she said security officials arrested one of the militants. "Because of the effort of the joint force, the terrorists could not flee," Hasina said in a nationally televised speech, vowing to fight militant attacks in the country and urged people to come forward. "Anyone who believes in religion cannot do such act," Hasina said. "They do not have any religion, their only religion is terrorism." A Japanese government spokesman said that a Japanese hostage was rescued with a gunshot wound but seven others are unaccounted for. Deputy Chief Cabinet Secretary Koichi Hagiuda said that the eight were together at the restaurant during the attack. Masud said that two Sri Lankans also were rescued. Others included an Argentine and two Bangladeshis, local media reported. The Islamic State group claimed responsibility for the attack, according to the SITE Intelligence Group, which monitors jihadist activity online. The Amaq news agency, affiliated with IS, also posted photos purportedly showing hostages' bodies. The authenticity of the images could not be confirmed. With the sound of gunfire and explosions, local TV stations reported that the rescue operation began at 7:40 a.m. It included army personnel with automatic weapons and at least seven armored vehicles and ambulances. The attackers did not respond to authorities' calls for negotiation, Masud said. The audacious attack came during Ramadan, when people in the mostly Muslim country fast during the day and eat after dark. On Friday evening, many people headed to the popular bakery and restaurant that serves Spanish food and is patronized by residents of Gulshan, an affluent neighborhood where most of the foreign embassies are located. The restaurant overlooks a lake and on pleasant evenings, diners often chose to eat outdoors. Kitchen staffer Sumon Reza, who escaped, said the attackers chanted "Allahu Akbar" (God is Great) as they assaulted around 9:20 p.m. Friday, initially opening fire with blanks. Rezaul Karim, the father of a Bangladeshi businessman who was rescued along with his family, said the attackers did not harm any hostage who could recite verses from the Islamic holy book, Quran. Karim said his son, Hasnat, had gone to the restaurant along with his wife and two children to celebrate the birthday of his elder daughter when the attack happened. "He told me, 'Please save us, please!' And he hung up," he said. Karim said his son told him that the attackers "did not hit people who could recite verses from the Quran. The others were tortured," he said. "The gunmen asked everyone inside to recite from the Quran. Those who recited were spared. The gunmen even gave them meals last night," Karim said. He said detectives were questioning his son and his family as part of the investigation. Police said the two officers died at a hospital after being wounded in the initial gunfire. Ten of 26 people who were wounded when the militants opened fire were in critical condition, and six were on life support, according to hospital staff. The injuries ranged from broken bones to gunshot wounds. Only one civilian was among the wounded. The attack marks an escalation in the militant violence that has hit the traditionally moderate Muslim-majority nation with increasing frequency in recent months. Most attacks have been by machete-wielding men singling out individual activists, foreigners and religious minorities. The government did not directly comment on the IS claim but has denied that the extremist group based in Syria and Iraq has a presence in Bangladesh, instead blaming the recent violence on its political enemies. In Washington, a White House official said President Barack Obama was briefed on the attack by his chief counterterrorism adviser Lisa Monaco. The president asked to be kept informed as the situation develops, said the official, who was not authorized to speak publicly about the president's meetings. The recent attacks in Bangladesh have raised fears that religious extremists are gaining a foothold in the country, despite its traditions of secularism and tolerance. About two dozen atheist writers, publishers, members of religious minorities, social activists and foreign aid workers have been slain since 2013. On Friday, a Hindu temple worker was hacked to death by at least three assailants in southwest Bangladesh. IS and and al-Qaida affiliates have claimed responsibility for many of the attacks. Hasina's government has cracked down on domestic radical Islamists by making scores of arrests. It has accused local terrorists and opposition political parties — especially the main opposition Bangladesh Nationalist Party and its Islamist ally Jamaat-e-Islami — of orchestrating the violence in order to destabilize the nation, which both parties deny.